Our WB Day Surf Camp Unit Leader Instructor Chase O’Briant is about as stoked on surfing as any one person can be, hence his love of the ocean spills over to anyone he meets. He best demonstrates this in his passion for teaching others how to surf. 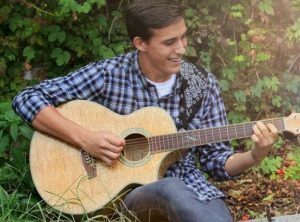 Many people describe Chase as a true waterman – someone who who finds true happiness when his toes dig into the sand and he holds a guitar. We sat down with him recently to ask what makes him tick. I’ve enjoyed surfing for most of my life and wanted the opportunity to teach others how to surf as well as the chance to work in the water. Being born in Wilmington, most of my childhood summers were spent at the beach, and these summers surfing and fishing have helped me make and maintain some of my closest friendships. New Mexico, there might not be a beach there but the rocky mountains are beautiful there. Jimi Hendrix, he never took one lesson and is one of the greatest musicians to ever pick up a guitar. I like playing my guitar, backpacking, playing soccer, and fishing. Hopefully somewhere on the coast, practicing law after finishing school.